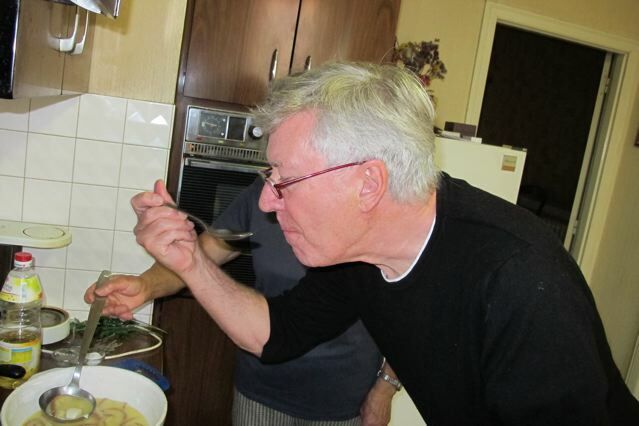 I ring our neighbour Alice, who delivered the magnificent tresses of garlic yesterday, thank her for the thrilling present, and ask if she’d be willing to show me how she makes her version of garlic soup. She says she’d be delighted and we fix for us to go over to the farm at 3pm. In her kitchen she’s put out the ingredients ready on the counter. I thank her for agreeing to this and she says the pleasure is all hers. 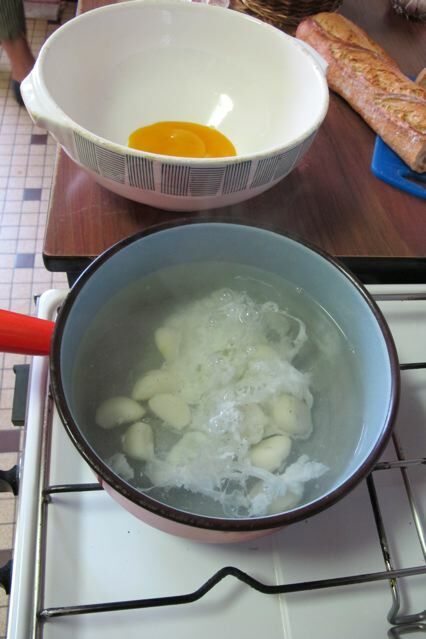 Garlic, eggs, water— the simple ingredients for this traditional peasant soup– “La recette de Maman”–says Alice. 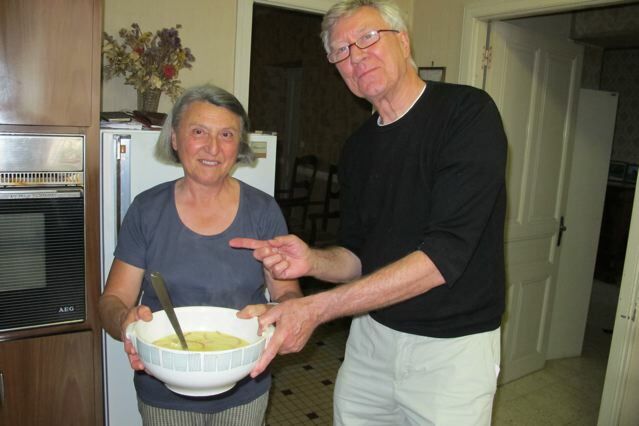 She prefers bread–a day or two old [rassi-stale]–to go into the cooked soup; some people put pasta like vermicelli in it, she says, but her brother René doesn’t like it. The pain de campagne comes from the oldest boulangerie in Castres. She’s sad because it’s closing–the owners couldn’t find anyone to take it over. The same thing happened to my favourite fish shop–I say. She fills a saucepan with about 700 ml of cold water, puts the lid on and lights the flame. While the water is heating she peels 8 to 10 cloves of garlic. 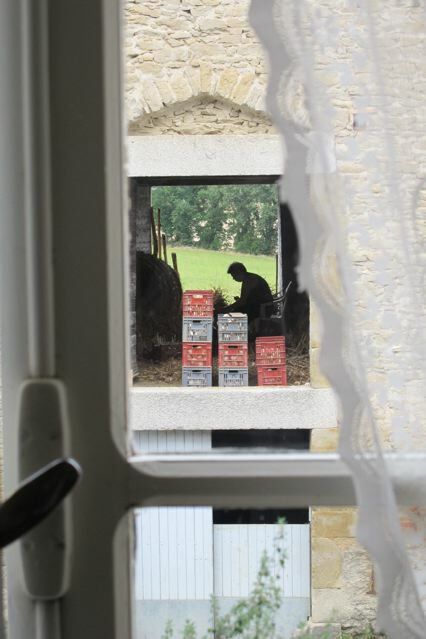 Through the window of the kitchen across the courtyard there’s a young woman working upstairs in the barn. She is preparing the tresses of garlic for drying out in one of the barns. 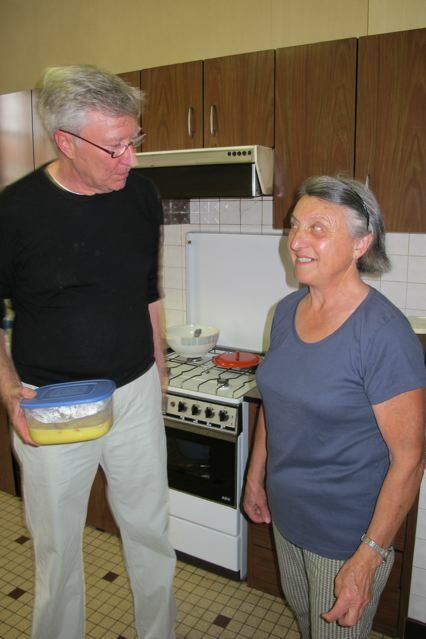 Celine and her husband have rented the farm for 25 years from Alice and her brother–who retired a couple of years ago. Later I ask Alice if she misses this labour intensive working of the garlic. “Pas de tout” she says emphatically–smiling. The water boils and Alice puts in a large teaspoon of salt and the garlic. depositing the yoke in the bowl in which she’ll later make the mayonnaise. She repeats this with a second egg. 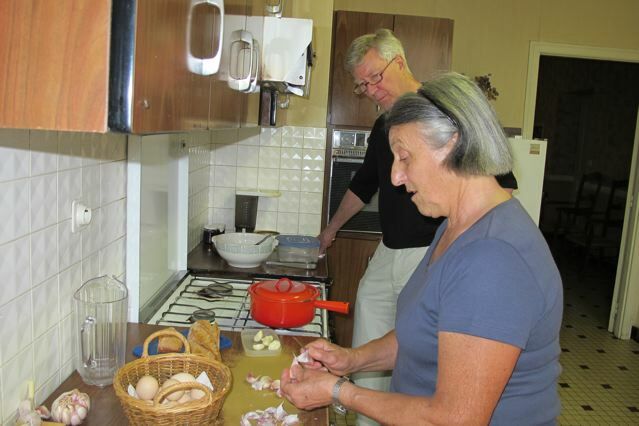 While the garlic is softening, she makes the mayonnaise and talks. 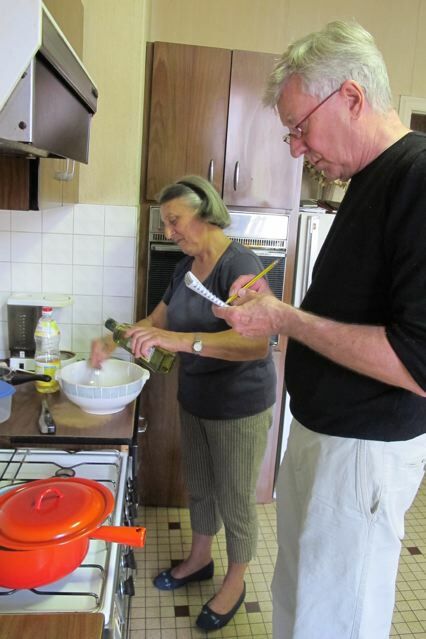 In the Gers–the other side of Toulouse–they brown the garlic in a little oil and add it to stock rather than water, she says. She and her brother have a vegetable soup at midday with a little meat and a salad. Soup again in the evening–and salad. I ask about cheese. Only at breakfast, she says. 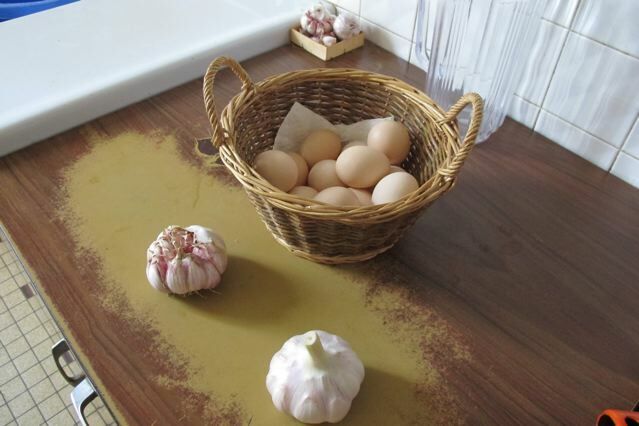 She makes the mayonnaise by first adding a big pinch of pepper to the egg yokes in the bowl. Then she whisks a teaspoon of Dijon mustard into the yolks. She favours peanut oil but opens a bottle of olive oil when I say I prefer it. 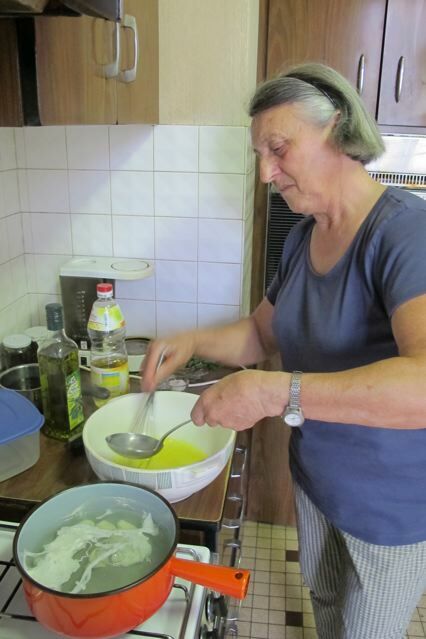 She pours the oil–very slowly to start–into the mixture, whisking steadily to avoid it separating. It’s hard to tell how much oil she uses–she just knows when it’s ready. Now she makes the soup. She ladles the garlicky water carefully into the mayonnaise– stirring with each ladle and adding the cloves of garlic and egg white bits at the end. 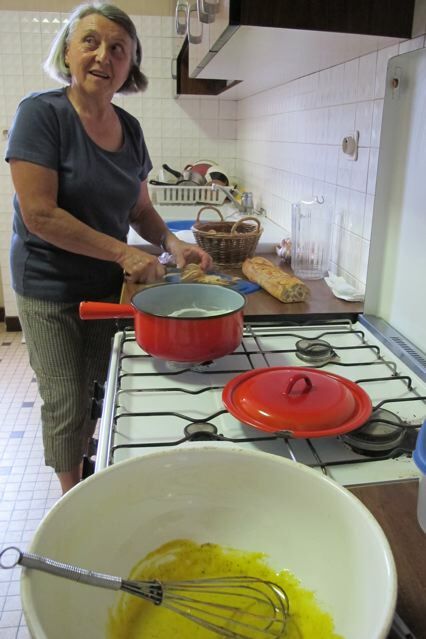 Finally she slices some stale country bread and adds it to the runny soup. 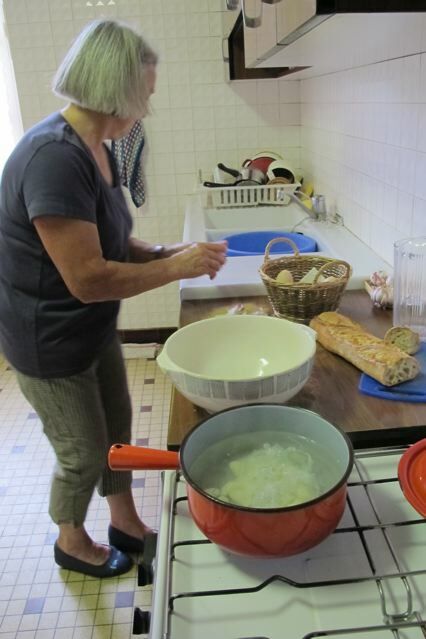 “Voilà la soupe a L’ail!”– she announces with a theatrical flourish! –though when I try it at home, a little less salt and some small wholewheat pasta in place of the bread, will be my choice. Sounds delicious! But how did your neighbor feel about all the photo taking? I’m guessing she is not camera shy? It’s a fair point. Alice has been “in the picture” before. She seems not to mind. Sounds fantastic and am going to try it this weekend. Terrific and fantastic recipe!! Thanks Alice & Robin!!! p.s. love the pics! !